I've always been a clothes horse, but accessories usually took a backseat to my addiction to clothing. About five years ago I started getting into bags and shoes and now I have moved on to sunglasses. Living in Los Angeles means that sunglasses are part of your daily wardrobe all year around. I don't have a ton of sunglasses, but I think it's nice to have a handful of unique, signature ones. For a while it was my Prada "Baroque" round sunglasses with the curly q temples. (My father-in-law makes a joke about them every time I wear them, so now you understand where my husband's biting wit about my wardrobe comes from!) Now, I have moved on to more colorful options like these turquoise and tortoiseshell ones from Stella McCartney. Now that summer is here, I can think of about a million things I want to wear these turquoise shades with, especially some of my wardrobe that is in hues of pink because who doesn't love the retro feel of pink (especially hot pink) and turquoise together? 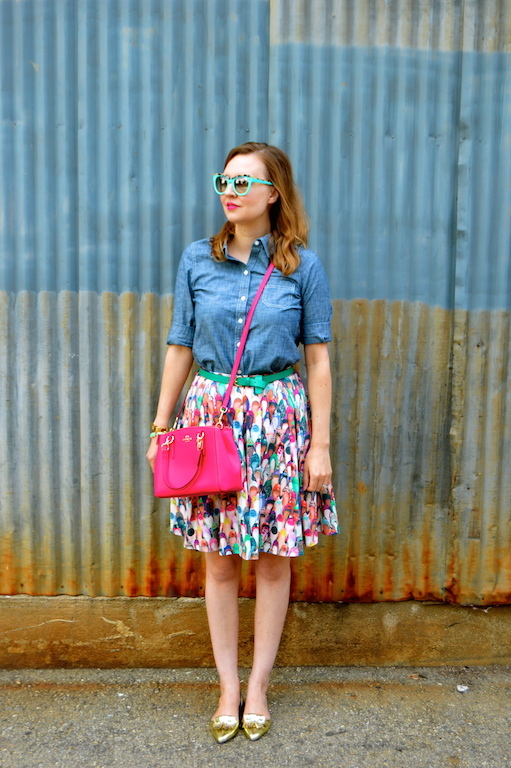 Today I am wearing these shades with one of my all time favorite skirts featuring a plethora of shoes. 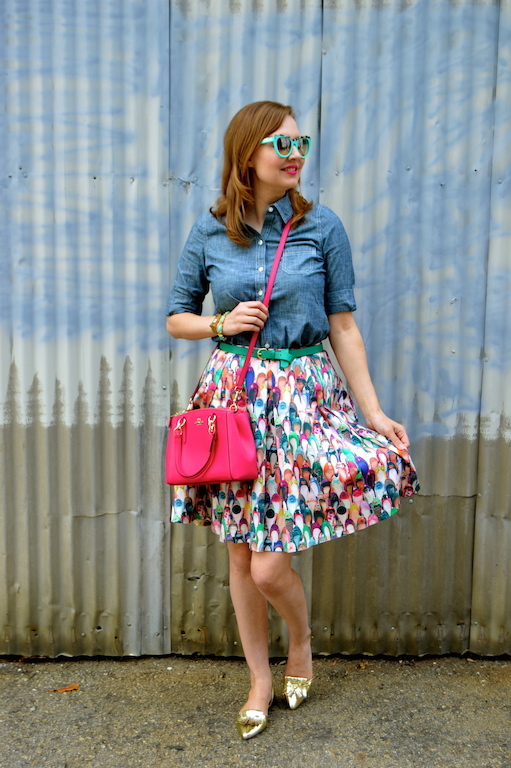 I love this skirt because the shoes are so colorful that it is a cinch to match it to just about anything in my wardrobe. In honor of my brand new shades, I am featuring some other sunglasses below. 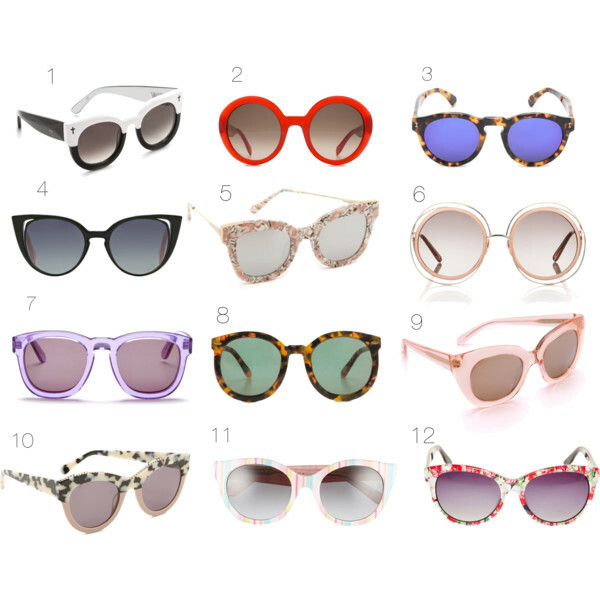 While some are more traditional, I tried to pick others with unique styles or colors that would definitely make a statement this summer because, as I stated before, sunglasses are a great way to create a signature look in your wardrobe. 10. Stella McCartney Colorblock, 11. Kate Spade "Melly", 12. Betsey Johnson "Flower Patch"
I'm in the market for some new sunglasses, and I love the idea of getting a "signature" pair in a bright color--love your turquoise ones. And that skirt!! I didn't realize it was shoes on first look... how awesome is that?! 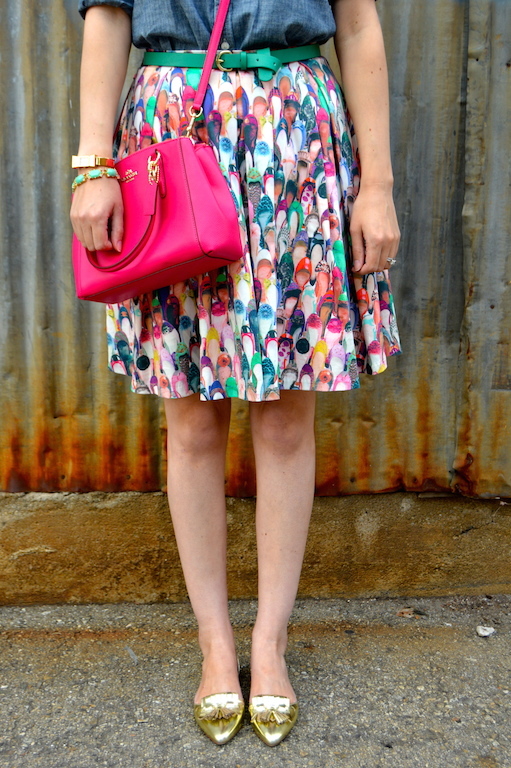 Such a fun and colorful outfit! Absolutely beautiful! 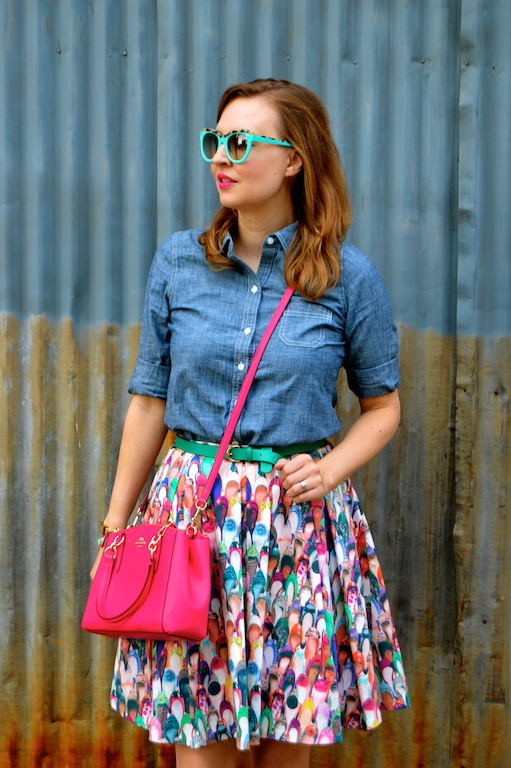 I love the print on that skirt. It does go with everything! 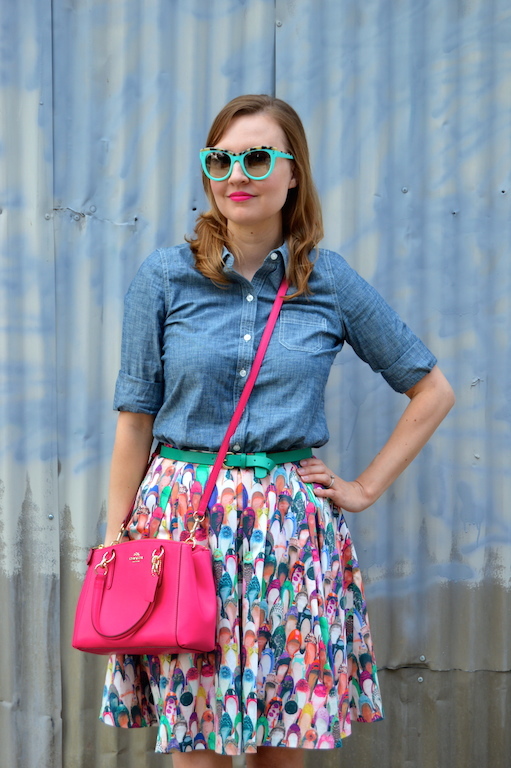 How fun is your skirt? 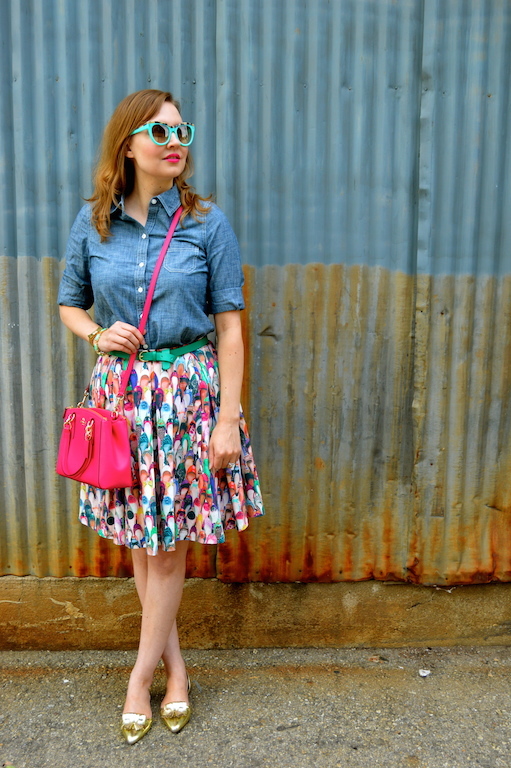 Love your use of all these bright colors, and your sunglasses are fantastic! Great minds think alike! 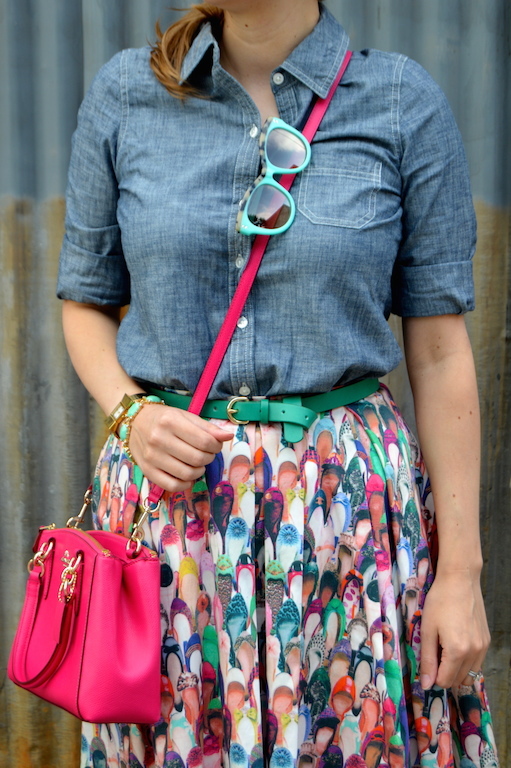 Love the colorful skirt and the whole look is so fun. We both have sunnies on the brain , love the color of yours. I only wish I didnt have to get prescription! What a fabulous skirt! 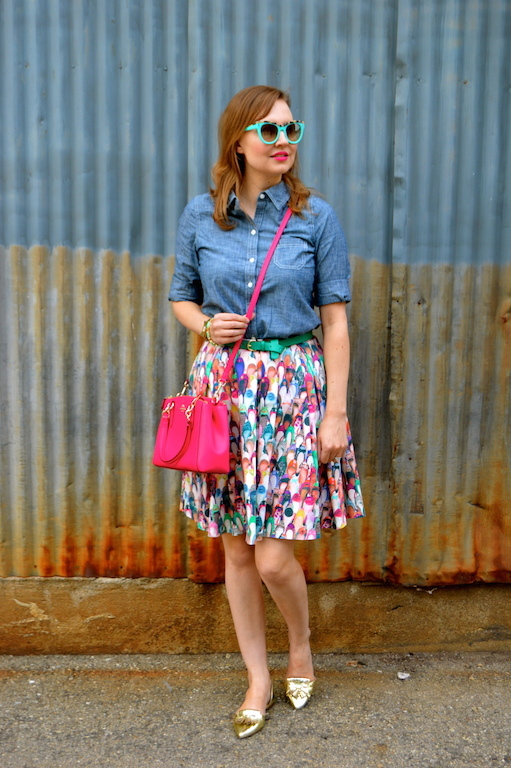 Love how you've put this look together and I adore those shoes! What a playful skirt! You really do have some fun skirts. And turquoise and pink is one of my favourite colour combos. Perfect for Spring! Fab sunglasses. I was just thinking of you and your shades today before I read this post. I definitely need to get some more when I spot some cute ones here and there. I may even venture to try colored ones sometime.